For a beginner to Reformed theology, this book will give the basics of TULIP in an accessible way. If you are firmly already in the "ANTI-" camp, don't bother reading the book, you'll hate it. But if you want to learn about the theology, with an open mind, this is a great place to start. This book begins at the beginning. Boettner teaches in this book that all of "TULIP" stands or falls together and starts with the "T" - total depravity. For Boettner, the sovereignty of God is something to be glorified, not hated. We deserve nothing from God, and the idea that He saves some at all is a testament to goodness. Each segment is supported with Scripture, and explained thoroughly. There is a little bit of "here's where the other side is wrong" - and sometimes in not very graceful language - but even those are framed in "here's why from Scripture"
I read the Amazon reviews and there were a few of "one-star" reviews. ALL of these were not based on the writing of the book, but on their disagreement with Calvinism. Posted in Book Reviews, Reformed Theology, TULIP. Tags: Book Review, Christian (Reformed), Christianity on June 23, 2013 by MzEllen. at 28% done, I decided to call it a day. the book is listed at a "bargain price" and is written by a pilot who flew with the "movers and shakers" of the war. It communicates a lot of information, but in a way that is not all that readable. I did take away a renewed understanding of the futility of the Viet Nam war, and I guess it's a good thing that we look at ALL war with the same cynical eye. Posted in Book Reviews, Opting Out of. Tags: Book Review, Books on January 31, 2013 by MzEllen. ★★★★★★[relatedratings=null]This year I read through "God Is In the Manger" for Advent. These forty stirring devotions will guide and inspire readers as they move thematically through the weeks of Advent and Christmas, from waiting and mystery to redemption, incarnation, and joy. Supplemented by an informative introduction, short excerpts from Bonhoeffer's letters, and passages from Bonhoeffer's Christmas sermons, these daily reflections are timeless and moving reminders of the true meaning of Christmas. Now repackaged in a beautiful hardback edition, it makes the perfect holiday gift. For me, reading the words of Bohnhoeffer, many of them from prison, reminded me of that different time. We have felt for a while that the USA is on the verge of some version of that "different time" and the words of encouragement from prison resonated. Each day there was a devotional, a few words from Bohnhoeffer, and a Scripture passage. I would do this one again, and will buy a couple over the year so that I'll have some to give away. Posted in Book Reviews, Christian Book Reviews, Christianity. Tags: advent, Book Review, Christianity on January 9, 2013 by MzEllen. Holiness: Its Nature, Hindrances, Difficulties, and Roots by J. C. Ryle. It's $.99 and the best buck I've spent in a while. I have a loosely structured reading plan that includes very recent "Christian living" books and (at the same time) less recent, or even very old writings. I have benefitted a lot from going back in time, to a less "cluttered" written landscape. A book on holiness, written more than a century ago, brings a clarity to the purpose of holiness. We've forgotten what holiness means, much less the role that holiness should play in our lives. The characteristics of Bishop Ryle's method and style are obvious. He is pre-eminently and always scriptural and expository. He never starts with a theory into which he tries to fit various scriptures. He always starts with the Word and expounds it. It is exposition at its very best and highest. It is always clear and logical and invariably leads to a clear enunciation of doctrine. It is strong and virile and entirely free from the sentimentality that is often described as "devotional." The Bishop had drunk deeply from the wells of the great classical Puritan writers of the seventeenth century. Indeed, it would be but accurate to say that his books are a distillation of true Puritan theology presented in a highly readable and modern form. The Puritans had so much to say! If Ryle boiled it down, that's great. And in a Christian reading landscape that is full of "fluff," the "anti-devotional" writing is a welcome dive into the deep. I read devotionals and have found depth and peace and instruction - but rarely. You cannot find depth in a five minute swim. Ryle says that a wrong view of holiness are generally traceable to wrong views about human corruption; in order to have a correct view of holiness, you have to have a correct view of sin. Justification is the act of God about us, and is not easily discerned by others. Sanctification is the work of God within us, and cannot be hid in its outward manifestation from the eyes of men. Also...Don't EVER be ashamed of holiness. Not in front of the world, not in front of other Christians. Let us remember that if we would fight successfully we must put on the whole armour of God, and never lay it aside till we die. Not a single piece of the armour can be dispensed with. Posted in Book Reviews, Christian Book Reviews, Christianity. Tags: Book Review, Christianity, Holiness, Ryle on December 26, 2012 by MzEllen. ★★★★★★[relatedratings=null]★★★★★★"If God is Good, Why Do We Hurt?" Because I'm hurting this was not only a good book to read, it was a hard book to read. I don't like this paint and (even though the doctors believe it's an injury and not an ongoing thing) I'm ready to be done. Let God show me quickly what He wants me to learn and just get it over with. Whenever we’re tempted to think God has messed up our nice world by interjecting evil and suffering into it, let’s remember that in fact we messed up God’s perfect world by interjecting evil and suffering. Then he suffered evil by our hands so that we could forever be delivered from evil and suffering and death. Rather than blaming or resenting God, we should be overwhelmed with gratitude that because of his work of grace on the cross, our suffering need not be eternal, but only temporary. I am called to see this pain as a reminder how much He suffered for me. And he will deliver you through your present suffering, though not always from it. In fact, the Bible assures believers, “It has been granted to you on behalf of Christ not only to believe on him, but also to suffer for him” (Philippians 1:29). Jesus said, “In the world you will have tribulation” (John 16:33, ESV). Suffering—whether from persecution, accidents, or illnesses—shouldn’t surprise us. God has promised it. And when it comes, people should lose their faith in false doctrine, not in God. But even now, as you face suffering, God will give you joyful foretastes of living in his presence. That’s his promise as well, and also his instruction: “Dear friends, do not be surprised at the painful trial you are suffering, as though something strange were happening to you. But rejoice that you participate in the sufferings of Christ, so that you may be overjoyed when his glory is revealed” (1 Peter 4:12–13). If I take away nothing more than that from this book, it will be well read. Posted in Book Reviews, Pain. Tags: Book Review, Christianity, pain on December 6, 2012 by MzEllen. ★★★★★★"Not So Easily Washed Away"
the book says that the story is true, but it reads like made-up erotica...but maybe not. The teller of the story swings from anger to desperation, from threats to pleas. A lot of it sounds as if it cannot be. The parts before she comes to American...maybe. There are many reports that come out of Arab parts of the world that make this story ring true. The part where she is here? I hope these things cannot happen, but I know that they do. The book is not well written, the writing is shallow and the characters unreal. There is a second book, but I most likely will not read it. Posted in Book Reviews. Tags: 1 star, Book Review, non-fiction on July 18, 2012 by MzEllen. As I was reading this book, the first part seemed like it is full of "white guilt" - expanding the sin of racism to all white people in the USA by virtue of the color of their skin. After that, Piper explores individual sins on both sides of the issue - "both" because the reality is (at this point, anyway) the big divide seems greatest between African-Americans and Americans of European descent. There is plenty of sin to go around. 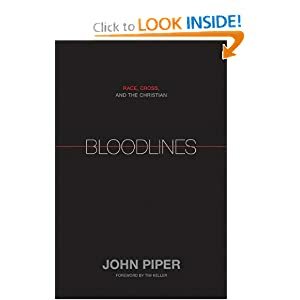 When Piper gets into the meat of the topic - WHY it is a sin and why it matters, this is an excellent book. I also broadened to topic to include "favoritism" (not just the race kind) and it became more excellent. From chapter 6 on, the book is steeped in the Gospel. We are all created in the image of God - to practice favoritism in any way strikes at the image. Posted in Racism (favoritism). Tags: 4 stars, Book Review, Books, Christian issues, Christianity, racism on July 15, 2012 by MzEllen. ★★★★★★"Mercury Rises" is a fun sort of tale of angels and demons and humans who are (mostly) acting with a piece of information while chasing around the world trying to stop (or start) the apocalypse. Fiction is "mind candy" for me most of the time - meant to be fun and tasty without a whole lot of substance. This fits that bill. I'm planning on reading more in this series. Posted in Book Reviews. Tags: 4 stars, Book Review, fiction on July 13, 2012 by MzEllen.